The culture of Bangladesh reflects the way of life for the people of the country. Festivals of different religions and cultures is one of these reflections. 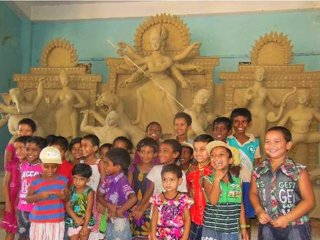 Durga Puja, for example, is one of the most important events in the Bengali society's calendar, meant to epitomize the victory of Good over Evil. This festival is widely celebrated in Meherpur, across the Hindu community. Relatives from different parts of the country or from neighboring India join this ritual each year. At the beginning of autumn a rigorous preparation starts for celebrating this festival. The Puja committee hires the best clay artisans they can afford. Pals, or clay artisans, have an age old tradition of breathing life into images of Hindu Gods and Goddesses. For Durga Puja, first bamboo sticks are cut in various shapes and sizes to make the basic structure of the idols of the Goddess Durga, and the platform on which the colossal statue stands. Durga's figure is then shaped with straw tied with jute strings. The straw figurine of the Goddess is then applied with a first coat of clay solution with the percentage of water high. This helps to fill the crevices left by the straw structure. The second layer is applied with great caution as it is the most important layer, giving prominence to the figure. The clay mixed in this step is very fine without any impurities. The lengthy and backbreaking process of constructing the idols is done diligently and methodically by the artisans, to create the most exquisite pieces of artistry. The perfection of idol making demands that the skeleton structure of bamboo and straw be done by one group of artisans, the clay mixing and applications are done by another group, and finally the head, palms, and feet are done by the highest graded Pals. It is a popular belief that the Goddess Durga arrives and departs to predict the lives of people for the coming year. 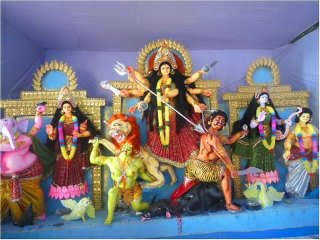 Durga reigns through her clay and straw figure for 6 days, standing on her lion mount, wielding ten weapons in her ten hands. At the end of the festival, the sculpture is taken in a procession, amid loud chants of, "it will happen again next year," and drumbeats, to the river or other local body of water. She is then cast in the waters, symbolic of the departure of the deity to her home with her husband in the Himalayas.